In Janet Burroway’s chapter on character in Imaginative Writing, she observes that “one of the ways we understand people is by assessing, partly instinctively and partly through experience, what they express voluntarily and involuntarily” (92). 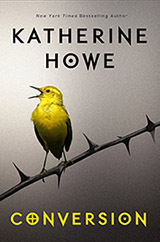 I thought of those lines of Burroway’s when I read the prelude to Katherine Howe’s novel Conversion (2014), which my students and I studied as our own prelude to Howe’s upcoming presentation as one of the featured writers in the Lenoir-Rhyne Visiting Writers Series. Though Howe doesn’t initially reveal the name of the first-person narrator, Reverend Green calls her Ann, and a later reference to the Putnam family leads readers familiar with the Salem Witch trials to conclude that the narrator is Ann Putnam, one of the key witnesses who publicly apologized in 1706 for her role in the trials. His tongue creeps out the corner of his mouth while he writes, the tip of it black with ink, the blacking in his gums staining his teeth. He looks like he’s got a mouthful of tar. I’ve been waiting for some time, but Reverend Green’s still writing. His quill runs across the paper, scratching like mouse paws. Scratch scratch, dip, scratch, lick, scratch. Why does Howe present the image of the minister’s mouth blackened by ink intended for the page? What greater discrepancy might that image suggest? 1. A portrait of a character based on what he or she reveals involuntarily. 2. A narrative that juxtaposes historical and contemporary characters and events. Burroway, Janet. Imaginative Writing: The Elements of Craft. 3rd ed. Boston, Longman, 2011.